When I first saw the movie poster, I was convinced this was going to be some love story between two partners and my expectations were low. If you read the synopsis above (I haven’t until now), you already know I had been wrong. 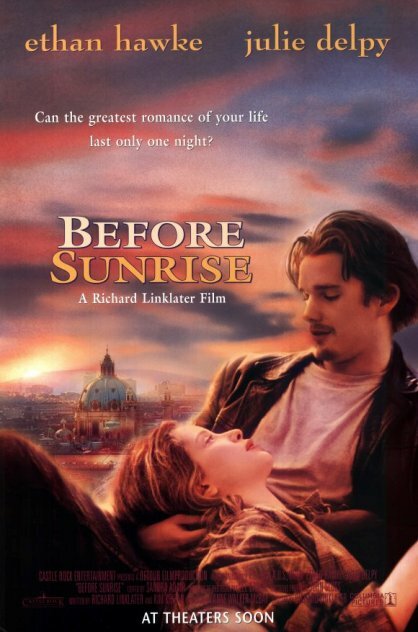 Before Sunrise follows the story of two travellers, who met on a train and fall for each other. The spontanious decisions Jesse and Céline make, led them to one night together in Vienna. In the morning they say goodbye, knowing they’ll probably never see each other again, but still hoping they would. The director Richard Linklater did a great job presenting the story realistically. It’s believable and even more, many solo travelers will be able to relate. The connection between the young wanderers (played by Ethan Hawke and Julie Delpy) is so convincing I sometimes forgot I was watching a movie. It felt like a friend was telling me about their summer romance. This is not a movie of beautiful landscapes and brightly colored archictecture. Vienna is in a background. The young adults stroll through the city while talking their past, present and future, so the movie is based on their interaction. Topics they talk are provocative. Remember those late night conversations we’ve all once had with close friends, probably after sharing a drink or two? All those honest discussions, combined with Jesse’s and Céline’s body language, make this remarkably good film hard to forget. If you like it as much as I do, make sure to watch Before Sunset (2004) and Before Midnight (2013) too. All of them are terrific, although I still think the first one of the triology is the best. Celine: When you talked earlier about after a few years how a couple would begin to hate each other by anticipating their reactions or getting tired of their mannerisms-I think it would be the opposite for me. I think I can really fall in love when I know everything about someone-the way he’s going to part his hair, which shirt he’s going to wear that day, knowing the exact story he’d tell in a given situation. I’m sure that’s when I know I’m really in love. Jesse: Rich kids parents gave them too much. Poor kids, not enough. You know, too much attention, not enough attention. They either left them or they stuck around and taught them the wrong things. Celine: Isn’t everything we do in life a way to be loved a little more?